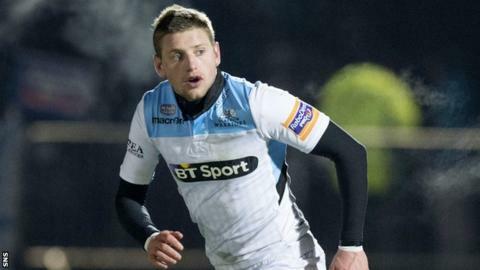 Glasgow Warriors have signed stand-off Finn Russell on a two-year deal, starting from the beginning of the 2014-15 season. Russell, 21, arrived at Glasgow in the summer of 2012 after impressing with Falkirk and Scotland under-20s. He made his debut off the bench against Zebre last season and started in the home match against Dragons last month. "I've learned a lot over the last 18 months and I want to continue to learn from the coaches," said Russell. The former Ayr man also played for Lincoln University in Canterbury, New Zealand over the summer, after becoming the latest recipient of the Macphail Scholarship. Following a four-month spell in New Zealand, he was voted the club player of the year. Glasgow Warriors head coach Gregor Townsend said: "Finn has a very good range of basic skills, and is tough tackler. That's an excellent base to build on as a stand-off and we're delighted he's staying at Scotstoun. "He deserves this opportunity after working hard on and off the field since he came to the club. "We had really positive reports on him from the EDP coaches, as well as the coaches at Canterbury in New Zealand, while he was over there in the summer. "Finn has looked composed when involved with the first team squad this season and that experience will benefit him as he continues to develop."